Since childhood I have had an interest in the macabre, so naturally I was instantly drawn to this remarkably researched book. Author Bess Lovejoy took inspiration from a Guardian article about the painter Francis Bacon. According to the article, before Bacon died in 1992 he told a barman at the Colony Room Club in Soho: “When I’m dead, put me in a plastic bag and throw me in the gutter.” Bacon never actually ended in the gutter, but after he died a friend photographed him inside a plastic bag at the morgue. The photo became the centrepiece of a show used to raise money for the Colony Room Club – and caused a bit of a bad taste uproar. It was a few days after this that the BBC ran articles about the pianist André Tchaikowsky, who had willed his skull to the Royal Shakespearean Theatre Company – people got very upset about that too. So what does become of the last wishes of famous people? And with so many famous dead people over the years, where does one start? The first thing that you might notice about Lovejoy’s Rest in Pieces is the physical shape of the book. Coffin-shaped, you might say. A neat conceptual joke, but it does make it a little tricky to hold and read, especially if like myself you have such small hands. Luckily for the reader, the author has kindly separated this book into differing sections of the dead, which in turn makes it a great book to be able to dip in and out of. 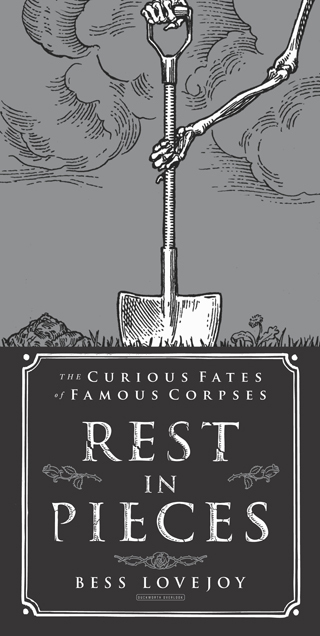 The impressive compendium of fifty cases is not just of famous people, but also notable figures in history or society, whose afterlives were just as bizarre as their physical ones. The entries are short, usually just a few pages, and give a brief history of the person’s life, as well as the strange events that happened after their deaths. I found the whole thing very intriguing, sometimes gruesome, whilst other times quite sickened and saddened at the lengths that some people will go to just to get their hands on some other human beings’ remains to claim a sort of bragging right. However, the author does try to tackle everything with good humour and respectfulness. The book reveals how differently we regard human remains these days, as opposed to the past. There are insights into deaths that some may have always thought were urban myths. The stories are very detailed with plenty of facts and history, and all are guaranteed to be perfectly strange. We even learn how to get rid of a body. Many of the stories involve grave robbing for financial gain – even from the modern day tissue thieves who illegally sold Alistair Cooke’s remains for profit, resulting in the transmission of HIV, hepatitis C and syphilis to some unsuspecting recipients. Einstein’s brain was taken by a researcher and, for years, stored in a jar in his closet. The skull of composer Joseph Haydn was stolen by a phrenologist for studies, as was the Marquis de Sade’s, and somehow the genital remains of Napoléon Bonaparte ended up in New Jersey. The author leaves no gravestone unturned in her quest. In the lost and found section you will discover that Hitler moved the remains of Frederick the Great and his father to a salt mine, where presumably they would not be found by the Allies, but were nonetheless discovered three weeks later by American troops. As the coffin saw the light of day, the British radio began to play ‘God Save the King’ to celebrate the victory in Europe. Whilst death can be an extremely serious business for most folks, there are some souls that definitely wanted to go out with an almighty bang. The writer, Hunter S. Thompson, requested that his lifeless body be shot from a cannon to the tune of ‘Mr. Tambourine Man’ – and with the social circle of friends that Mr. Thompson had, they certainly had the means to make this a reality. One of the greatest oddities in the book is about the British philosopher, Jeremy Bentham who was best known as the founder of utilitarianism. He once wrote about ‘further uses of the dead to the living,’ which included, apparently, being used as home décor. After his death, a friend of Bentham had his skeleton dried out and made it into something not dissimilar to a scarecrow, which even sported the corpse’s hair. You can actually still see what is left of him in a display cabinet at the Anatomy Museum of the University College, London. The body snatchers of Charlie Chaplin, demanded 600,000 Swiss francs for the return of his remains. However, the most touching story is the lengths that two of Dr Livingston’s servants went to in order to return his body back to England. After a uneducated embalming to try and preserve him, they then had to try and get through central Africa where corpses were considered disease ridden and dangerous and people with them were given heavy fines or subjected to vicious attacks. For certain, the curation of the characters in this book offers up plenty of dark variety. It’s morbidly moreish literature for any dark coffee table.